Dark Tide is a feature creature. No, don’t bother re-reading that line. It was correct the first time. Well, it’s a movie with a creature in it. That’s the first requirement. The second is that it has to prey on movie lovers, possibly by taking an extremist or sexist angle. In Dark Tide’s case, it has a picture of Halle Berry baring cleavage bigger than the ocean itself. Seriously, that’s what the image depicts. By luring them in, the creature, in this case a two-hour snore fest with no sensible direction, strikes. It teases more Halle Berry cleavage, but instead, dissolves into a generic creature feature on its own. Stuck in its grasp, the viewer cannot escape, transfixed by its awfulness, wondering if Dark Tide could possibly get any worse. Then, the final blow: it does. At some point during the developmental stage, Dark Tide was not a narrative driven escapade. It’s not possible. Someone, somewhere down the filmmaking line wanted to make a documentary about sharks, or the people who choose to swim with them. Maybe they didn’t find financial backers until they promised a Godzilla-sized Halle Berry on the cover of the home video release. No direction exists for Dark Tide, scenes wandering into verbose dialogue it cannot escape from. Berry’s character turns from awfully obnoxious in her enthusiasm to a down and out shark swimmer who becomes infinitely careless in her work. No one here is sympathetic, Berry rushing a forceful millionaire into the water to swim with great whites sans checking a weather report. When the storm hits and control is lost, it’s natural selection for all. Good riddance. It takes 90-minutes for Dark Tide to make it that far (and another 20 for final closure), the in-between desperate for character drama it never establishes. 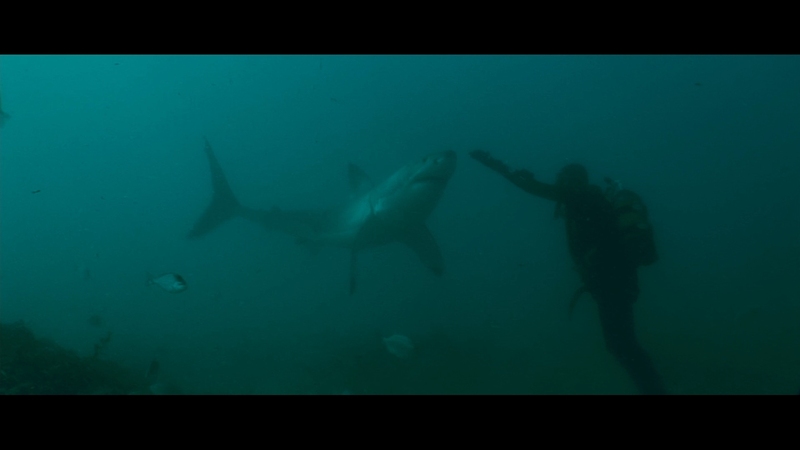 What is gained from the impressive shark footage is lost just above the water’s crest, making the idea interesting and the finished product an outright disaster. It’s even worse to consider the public outcry that will inevitably blame the shark for killing people, unbeknownst to them that it did a small flock of moviegoers a favor. The movie’s strongest asset is a pleasing, bright, pastel-ish color palette that is immediately appealing. The South African coastline is portrayed with vivid natural beauty which the saturation is able to emphasize. By the closing act, much of that has been lost to dreary, cloudy skies. A gray overcast will ensure the piece looks somber and understated for the attempt at dramatic storytelling. Transferred to Blu-ray via LionsGate, the end result is a choker that can’t handle basic color gradient. Banding creeps into the frame from the opening images, a flaw that will be retained in each underwater segment, of which there are many. On the floating surface, detail is crimped from close-ups to almost nothing, Dark Tide boring with glossy skin and imprecise sharpness. Best moments are those of the docks or other areas of Africa, where expansive views give way to the sole bright spot of this visual presentation. When the sun hits right and the water shimmers, it’s stunning, even if the resolution feels stunted. When needed most, the black levels will excel, namely those underwater vistas and the closing action at night. They’re reproduced with vividness and depth that seals the world off, giving the realm all to the sharks. Oddly, it’s when they’re not necessarily needed that they falter, topside on the boat. Shots veer off course and lose their toughness to a meager gray. Although mildly artificial, Dark Tide works to preserve the sense of being in or around water at all times. Waves push into the surface, travel idly by when panning, or rush during a storm. Under the surface, there’s the droning sound of pressured water, fully enveloping the listener. Panic is accentuated by heightened effects, and dramatic cues will let the bottom out. The LFE has full permission to go berserk for effect. Many elements are captured in the surrounds to create a consistent mix of DTS-HD glory. Cars pass by, people whistle, engines pan, and chatter will escape the center. A shot of a mirror at 12:45 has a vehicle approach entirely in the rear, shuffle to the front, then escape in the opposite surround. The effect is wonderful. Accentuation of these elements is what adds the false quality, raising them above normal levels for no reason other than to force the issue. Instead of being subtle, too much focus is placed on the rears. Fidelity is generally firm, save for a conversation inside the boat at 1:15:00, where instead of sounding as if the echo is happening inside the closed glass, it creates an in-studio effect. One bonus feature, and that’s a trailer. It’s worth mentioning that Dark Tide’s menu selection sounds are atrocious. It comes across like a distorted seagull and someone screaming with every button press. It’s a reprieve that menu options are so few.